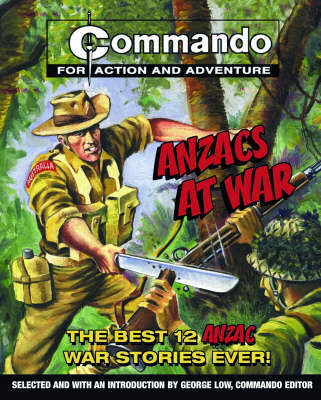 No collection of Commando war stories, the very best in action and adventure, although born and bred in Britain, would be complete without plenty of issues resounding to phrases like 'cobber', 'drongo' or 'pom'. Yes, the Aussies and Kiwis are here, and they're about to put in a two-fisted, explosive performance. You'd expect no less from these larger-than-life characters that are guaranteed to bring out the best in any action-packed Commando yarn. For everyone whose comic-book battle lust has ever been stirred by Nazi cries of 'Auslander schweinhund!' or Japanese shrieks of 'Banzai!' "Anzacs at War" will transport them right back into fictional combat situations they'd forgotten were so entertaining, and a whole new generation can discover how Commando turns ordinary men into heroes.